Great product from a great store! 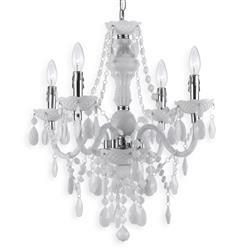 I purchased this mini-chandelier in opaque white. It's a great inexpensive alternative to much pricier milk glass chandeliers. Since it isn't real glass, it's much more light weight but has the exact same effect. You have to assemble once you receive but it makes sense. Otherwise the parts would likely bend or break. That bring said, it want difficult so long as you follow the instructions. It's a really pretty chandelier. As for Kathy Kuo Home, their customer service was impeccable. They were efficient, friendly and helpful! I highly recommend! A fun, alluring piece of bohemian style, this petite, white chandelier gives high style in simple materials. Who knew plastic could look so good? Dripping in teardrops and swag, this piece delivers a delightful, strong statement.